My mother used to make whole wheat bread. I loved to get it hot from the oven and put honey and butter on it. My children are no different than me. They love my whole wheat bread when it comes fresh out of the oven. They still prefer white bread, but I prefer having whole wheat bread as a staple. I have a grain mill and grind my wheat. I even have wheat grown from my brother-in-law's farm! HOW COOL IS THAT??? I believe it is hard red spring wheat. We visited them at their Melba, Idaho home this past summer and saw their acres of wheat growing! I even have a picture of my husband in the wheat fields, but I don't think he wants me to post a picture of him on my blog. In May, during our visit, the fields were so green and beautiful! Later in the season farmers stop watering the wheat, and the plant turns golden-colored. They do this to allow the wheat to boost its protein levels. wheat bread contains much more protein and fiber for about the same amount of calories. I haven't always made whole wheat bread; I used to buy whole wheat bread at the store. When we moved to a rural area in 2007, I couldn't find a decent whole wheat bread in town. I tried making it, but it always came out heavy. I just wasn't motivated to make it because I wasn't pleased with the product. 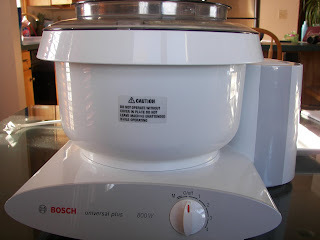 My husband presented me with a Bosch mixer on Mother's Day 2008 to enable me to make whole wheat bread. The Bosch sat, and sat, and sat...I am a bit phobic about trying new things. I am especially poor on following instructions. My sister Jeannie, who lives in Texas, visited us in October of 2008. She was only at our home for about 24 hours. When she heard I had a Bosch and was letting it sit, she got it out and we made bread. I have been making it ever since. Thank you Jeannie! 1. Use Vital Wheat Gluten (or egg whites): it helps to improve the quality and durability of the bread. 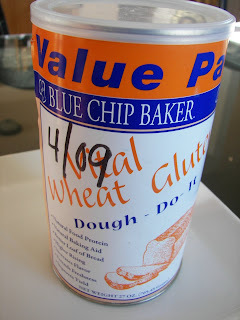 In Utah, Vital Wheat Gluten is readily available. I don't know about the availability in other locations. Sorry, for the date on the gluten; I date almost everything! 2. Use a Bosch Mixer. I have a Bosch Universal Plus (800 watts). I believe some Kitchen-Aid Mixers can also handle multiple loaves of whole wheat bread. The Bosch kneads the bread dough mechanically. I just don't have the arm strength, time or patience to knead whole wheat bread by hand. Bosch mixers are not cheap, but they are durable and so versatile. They cost about $400, but it is by far one of the best kitchen investments we have made. 3. If you don't like the height of your loaves, try baking them in smaller pans or only make three loaves instead of four loaves with this recipe. At first, I struggled with the look of my loaves. They always tasted good, but I wanted them to look like bakery-store breads. The dough just wasn't rising high enough in the pans for my taste. I talked to my sister Jackie about this and she suggested baking the batch in three pans instead of four. This did the trick for me! 4. Experiment and don't give up! It took me about nine batches before I was pleased with the results. Here is the recipe I use; it is from my sister Jackie. Thanks Jackie! Grind nine cups wheat. 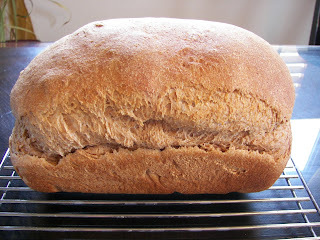 I prefer hard red wheat when making bread: I like to use white wheat when making pancakes, waffles or muffins. The Fresh Loaf Website has a great article on the different kinds of wheat. You can link to it here: http://www.thefreshloaf.com/node/6985/wheat-red-vs-white-spring-vs-winter. You can also just buy whole wheat flour at any grocery store. Nine cups of what will make about 12-14 cups of flour. Begin mixing and adding the remaining flour. Add flour until the dough pulls away from the edge of the bowl. You may have a cup or so of the flour leftover...save for pancakes or waffles. Mix bread at low speed for about 5 to 10 minutes. At this point, I take out the dough hook and let the dough rise in the Bosch bowl. Cover and let rise until double. The bread usually takes about 1-1/2 to 2 hours to double. When doubled, punch down dough and divide into 3-4 parts. Form into loaves by creating a rectangle and then rolling up tightly. Pinch seam and tuck ends under. Put in well greased (shortening) bread pans. Make sure you grease the sides. At this point, what you see is what you get. The shape or contour of your loaf will not change that much; it will only rise...so take care how you shape your bread. Cover loaf pans lightly and let rise until about 1 to 1-1/2 inches above pan. This usually takes 1 to 1/2 hours. Bake for 30 minutes in a 350 degree oven. Put loaves on cooling rack and let cool for about 10 minutes. That's one beautiful loaf of bread and a very impressive mixer as well. Baking bread is so satisfying. I love the whole experience.